Tour deCatur is This Saturday -Register Today! The weather is going to be beautiful so why not register for the Tour deCatur this Saturday, March 12. Tour Decatur is a qualifying race in the Team Decatur Grand Slam Fitness Challenge. This is the last year you will be able to earn the coveted Team Decatur jacket! 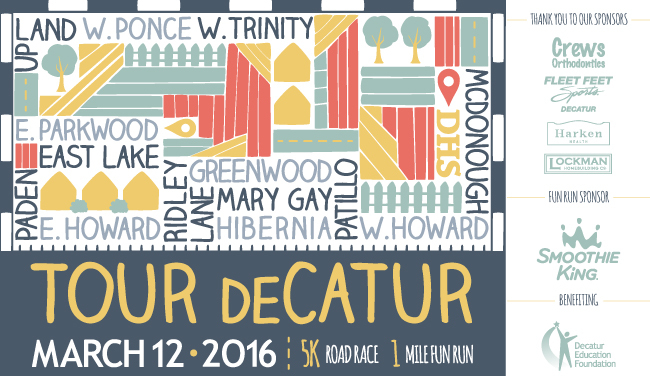 The Tour deCatur, now in its 14th year, gives participants the opportunity to run a 5k road race and/or a 1-mile fun run through neighborhoods of Decatur. This event started as a grassroots fundraiser for the Decatur Education Foundation and has grown into a community wide tradition with over 2700 participants. One registration fee allows participation in any of the events – 5k, 1 mile or Tot Trot. Funds raised by this event support the children and youth of Decatur by providing educational and enrichment opportunities. Registration and more information is here. Please take a few minutes to complete this very short survey – we want your opinion on how to make our run/walk events better!